The Herbert Art Gallery & Museum, Coventry will be taking inspiration from the street this Autumn as it showcases work from some of the best, freshest and most controversial street artists around. The UK premiere of the new temporary exhibition Street Art: Contemporary Prints from the V&A opens on 9 October, 2010 and is completely FREE to see. 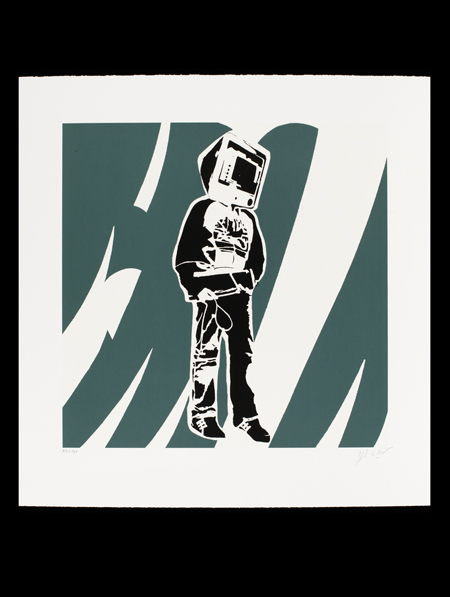 This brand new touring exhibition explores the ways street art has moved away from the painted wall into the medium of printmaking, creating distinctive, exciting visuals along the way. Drawn from the Victoria and Albert Museum’s internationally renowned collection of prints, Street Art: Contemporary Prints from the V&A showcases established and emerging street artists, both British and international, including names such as Banksy, D*Face, Eine, Miss Tic, Swoon and Shepard Fairey. The Herbert has commissioned six emerging artists on the UK street scene to create new works of art that will be displayed in a second complementary exhibition Fresh Paint. Pahnl, SPQR, Lucy McLauchlan, Ben Slow, AsOne and Newso have all created pieces that have not been seen before, and will not be seen together again.